Photos have given us a more detailed glimpse of the damage wrought on the Notre Dame cathedral’s interior after a catastrophic blaze damaged the world heritage-listed site. Take a look through each photo to see the damage inflicted on the cathedral by the fire. 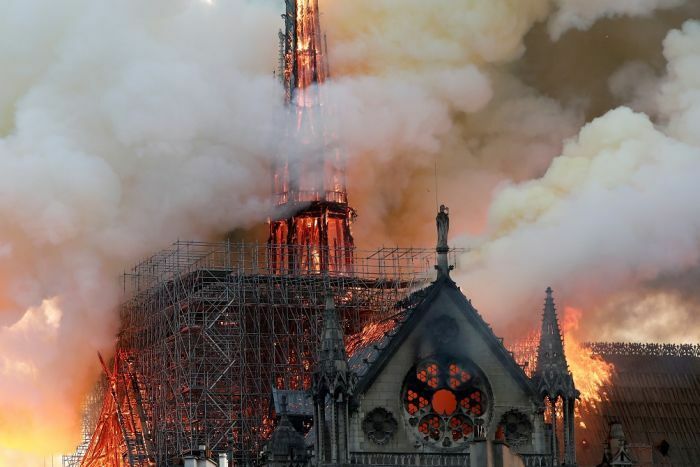 The fire blazed for several hours, damaging the roof and causing the spire to collapse, and came close to destroying the entire building. The cathedral is home to many centuries-old religious relics and artworks, which first responders scrambled to save as the fire raged. The cathedral attracts about 13 million visitors each year, ahead of the Eiffel Tower. French President Emmanuel Macron said the fire had burned a “part of us”, and pledged to rebuild the cathedral with the aid of a fundraising campaign. Huge crowds gathered at a number of vantage points in shock and disbelief to watch the fire. Authorities said the cathedral’s structure had been saved from total destruction. The loss of the spire — The Arrow, as it is known in Paris — left the city in mourning.